The recent growth in the popularity of pizza has been nothing short of amazing: while it's still arguably America's number one casual dining food traditionally consumed with beer or soda, it has also moved uptown, and can now be found in more upscale eateries, too. Pizzas boasting such toppings as tandoori chicken, roasted duck, artichoke hearts or fresh clams are being served alongside flavored martinis, local microbrews and a bevy of Italian varietal wines. In addition to a growing number of upscale pizzerias, traditional restaurants are also staking claim to their own signature pizza creations. It's even become acceptable for tie-and-jacket business lunches to convene over gourmet pizzas. It's no mystery why pizza has caught on in such a big way. In an effort to build a sense of community for customers inside pleasant surroundings that provide a haven from the pressures of today's life, retail food outlets and even educational food services today focus on creating a comfortable "home away from home." Pizza's always been a comfort food, and using it to create a customized signature dish makes a lot of sense – the product itself becomes a branding tool for the establishment. 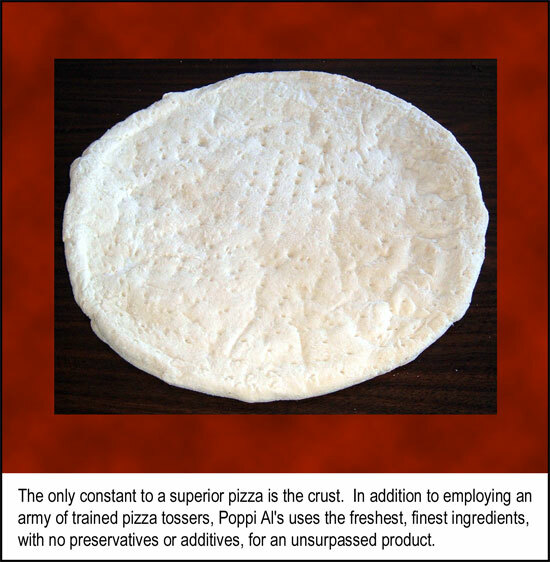 Making a good pizza crust, however, can be a demanding process, and a quick review of its history reveals why. Pizza in some form has been around for as long as civilization, and has evolved over thousands of years to its present state. The ancient Egyptians, for example, celebrated the Pharaoh's birthday with a baked, round flatbread seasoned with herbs, and the Greek historian Herodotus described Babylonians recipes that are very similar to today's pizza crust. The word "pizza" is thought by many to date from Roman times and is probably derived from the Latin word "picea," which describes the blackening of bread in an oven. Today's version of the pizza can be traced to pre-Renaissance Naples, where poor peasants used what little they had to create a seasoned flatbread garnished with cheese as a staple of their diet. In the latter part of the Nineteenth Century, pizza made its way to America, and one of the earliest American pizzerias was established in 1905 in New York City by Gennaro Lombardi. Lombardi's thin-crust pizza was served with a generous helping of tomato puree, grated mozzarella cheese and a variety of toppings, including sausage, mushrooms and pepperoni, setting the style that is still known today as "New York City pizza." By the 1990s, one out of every twenty meals served in American homes was pizza, and, as its popularity spread throughout the country, regional variations developed. The sauce and toppings you get on a pizza from New York, for example, differ from those found on a pizza purchased in California, say, or Wisconsin. The only constant to a superior pizza is the crust. "No matter what toppings you put on it, a pizza is only as good as its crust," says Mike Kubarek, executive chef at Sasha's Hideaway of Harrisburg, PA. "You know it when you taste it. And a really great pizza means dough that's made by hand and then hand-tossed." In fact, today the Associazione Verace Pizza Napoletana (Association of True Neapolitan Pizza) maintains strict guidelines for its members that cover ingredients, dough and the actual cooking process. The organization states that pizza dough can be made only with flour, natural yeast or brewer's yeast, salt and water. The dough must then be mixed by hand or by a mixer that does not cause the dough to overheat, and, finally, the dough must be punched down and shaped by hand. Mixing the dough in a way that does not cause it to overheat, and shaping it by hand are the two qualifications that make the creation of a good crust a demanding process. This process, however, demands a specialized staff as well as space and special equipment. The physical demands include a large brick oven, a marble counter where the crust is prepared, and a shelf full of fresh ingredients to achieve the unique, unmatched flavor of brick-oven pizza.."
"Mixing, working and tossing the dough by hand poses a challenge that many if not most restaurants are unequipped to deal with," says Kubarek. "Expensive dough-making equipment, finding room in a busy kitchen for a pizza station, and training – or adding – a specialist is usually neither realistic nor cost-effective." What then is the secret of the many popular sidewalk pizzerias of New York City, and how do upscale restaurants throughout America find room for the process it takes to make a great signature pizza in an already over-crowded kitchen? Frozen crusts! A restaurant serving a frozen pizza crust? Wouldn't a pizza purist or chef cry foul? Not when the crust is from Poppi Al's, says Kubarek. Poppi Al's, unlike all other frozen pizza crust makers, has an army of crust specialists who hand-toss crusts daily in the company's own plant. The crusts are then flash-frozen and shipped to hotel chains, fine dining establishments and bars throughout the country, even to many establishments in New York City. Yes – even in New York! With Poppi Al's there's no cheating on either the ingredients or, more importantly, the process. "Poppi Al's uses only the finest ingredients, and each crust is worked and tossed by hand – that's the key," continues Kubarek. Unlike the machine pressed crusts that come from corporate manufacturers, "the result is a consistent, ‘baked-from-scratch' flavor with minimal on-site preparation, and because it's hand-tossed, it makes for a really nice presentation when it comes to the table." In addition to employing an army of trained pizza tossers, Poppi Al's uses the freshest, finest ingredients, with no preservatives or additives, for an unsurpassed product. "Poppi Al's is probably the best-kept secret in the food industry," says Kubarek. "Because you can't fake the flavor." 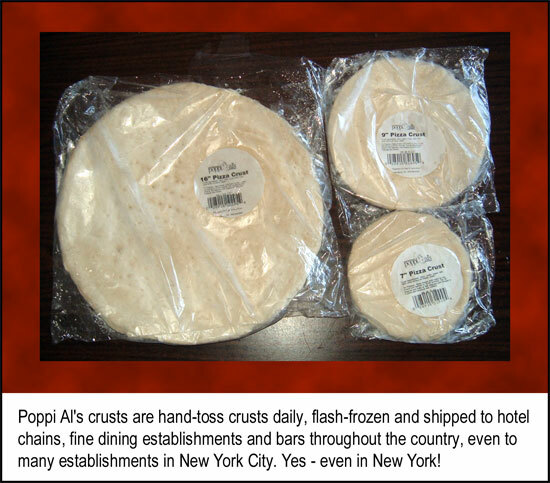 For more information about Poppi Al's hand spun gourmet crusts, visit http://www.poppials.com or call 1-800-296-6263.